The latest StarWars.com ‘Force Of Fashion’ article features Star Wars wedding dress inspiration. Author Catrina Dennis writes about some of the great ceremony outfits seen in the saga, including Padme’ Amidala’s wedding dress, and Princess Leia’s ceremonial outfit from A New Hope – check out the full article here. The recently released Lego Star Wars: The Force Awakens video game includes a fun bonus character – Lucasfilm CEO Kathleen Kennedy. In the game, Kathleen is seen wearing the stylish white blazer and Her Universe x Star Wars lightsaber logo t-shirt that she wore at Celebration Anaheim (as seen in this StarWars.com video). 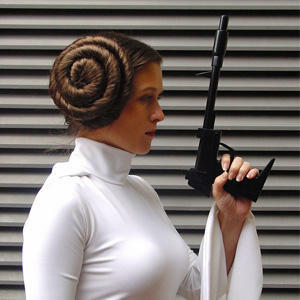 It’s fun to see a real world women’s Star Wars fashion item appear in a video game – read more at SlashFilm here. White Hot Room has a great interview with Jordan of Jordandené, a fandom apparel label. The designs include ‘I Rebel’, ‘Never Tell Me The Odds’, and even a ‘Matt the radar technician’ inspired design. Check out the full interview here, and visit the Jordandené store here. Bria from White Hot Room has made a fantastic Star Wars dress, using First Order themed printed fabric! I love the use of the print with black contrast panels, and her dress is perfectly paired with black heels – check out her photos here. Blogger Melificent has written an article with inspiration and tips for putting together outfits for conventions, which includes a Star Wars themed outfit. The look includes a Star Wars skirt, ‘Jedi’ cap, Covergirl x Star Wars nailpolish and a Rebel Alliance symbol necklace – check out her full post here. Melificent has also shared photos of her ‘girls nite’ outfit, featuring the Forever 21 x Star Wars droids knit dress – she looks great! Check out her outfit photos here. The Stylish Geek has put together a Jakku/Rey themed outfit, which includes one of the recently released Her Universe t-shirts. She paired the tee with a lovely skirt, cardigan, and heels – check out her photos here. The Stylish Geek has also posted a great DIY for customising a bomber jacket with Star Wars patches! Picking up an assortment of patches on eBay, her easy DIY has turned a store-bought jacket into a custom Star Wars jacket! Check out her full post with photos here. Blogger Catrina Dennis has shared photos for her Captain Phasma inspired ‘Disney Bounding’ outfit. She paired a grey and black dress with a Star Wars necklace and some great silver and black accessories – check out her full post with photos here. Blogger Johnamarie from thewookieegunner.com has posted two reviews of Star Wars clutches. 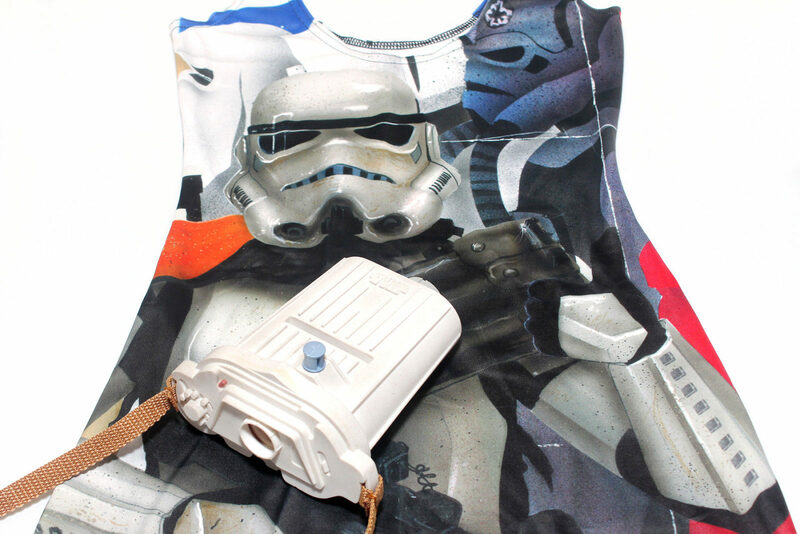 The first review features the BB-8 wristlet clutch from LootCrate, while the second review features the beaded Stormtrooper clutch available from Torrid. Fashionably Geek has shared some great Star Wars inspired kimono dresses! Designs include Rey, Poe, and BB-8 – I love the Rey inspired outfit! Check out the full post with photos here. Fashionably Geek has also shared amazing Star Wars couture concept designs by Instagram User cetinethedream. Her designs take inspiration from Princess Leia, C-3PO, Royal Guard, Boba Fett, and more – check out the full article here, and follow Cetine on Instagram!